One of the most valuable tools in any business, and especially in Dentistry, is the Mystery Shop. The Mystery Shop Process involves the creation of a false customer to trial the protocols and procedures of a business, often your own, with the intention of spying, or analyzing, or information gathering. Mystery Shopping a competitor is a great way of checking on what processes they are doing right, and also finding out what processes they may be struggling with, in their day-to-day business. Mystery Shopping a competitor then allows you to use this information gathered to compare back with your own processes and make valuable changes to your own procedures. Mystery Shopping your own business provides you with valuable checks and balances for your own processes. It gives you insights into which processes your team is performing well, as well as where they might be falling down and where they might need additional training and improvement. For example, it’s very difficult to Mystery Shop a steak house if you are a vegetarian. Similarly, in dentistry, I don’t believe anyone out there wants to Mystery Shop a dental office for their protocols and procedures in Oral Surgery and teeth extraction? Even the process of Mystery Shopping a dental restoration is really creating an unnecessary physical trauma for the mystery shopper. A few years ago now, a dental colleague of mine was one of three dentists that were Mystery Shopped for a weekend newspaper article, or exposé, on the Consultation appointment process for a patient enquiring about cosmetic dentistry procedures and options. In this story, the writer posed at three dental offices as a patient interested in a smile makeover. Although my friend did nothing in the appointment that he felt was wrong at the time, in hindsight, in the written word, he felt there were things said and done that could either be improved upon or even eliminated as unnecessary. For my friend, who is a successful dentist, this unexpected Mystery Shop was a real eye opener. One of the easier processes in the Dental Office to Mystery Shop is the process of phoning in for a Dental Appointment. Firstly, and most importantly, it’s a physically non-invasive procedure and process for the Mystery Shopper. And that’s good for them. I guess the purposes of the process of Mystery Shopping for a New Patient Appointment is to see which protocols and procedures are being followed by the Front Office phone answering person, and whether all steps and stages of that process are being covered and being performed to an optimal level. And dare I say, being performed to an exceptional level. It’s unnerving, when listening to your own office under the microscope. It’s also quite a traumatic process when suggesting improvements to your own office team members based on the Mystery Shop calls you have had made and recorded for your office. The reason that Mystery Shopping a dental office front desk is very valuable is that primarily, 99% of dental offices out there, and the percentage may be even higher, yes at least 99% of dental offices *DO NOT* have a check list of all the desired outcomes they would need to have achieved from a new patient enquiry phone call. And so, in analyzing calls to your own dental office and to other dental offices, be they dental friends and colleagues, or be they your dental competitors, the process of analyzing can be very interesting. Some offices like to make these calls to their office brief, choosing to schedule an appointment at all costs and then using that appointment itself as a point of capture or filtration as to whether there is a match or not between the patient’s dental wants and needs and which service the dental practice provides. Other dental offices carefully use the New Patient phone enquiry as a sifting tool in itself, so as not to schedule and waste time for both the new patient and the dental office if their visions are not congruent. Sadly, the majority of new patient phone enquiry calls seem to fall into a hotchpotch in between these two ideologies. The content of a new patient enquiry phone call is the subject of a whole new blog posting, and probably a whole book as well. In summary, at the conclusion of the new patient enquiry call, the following three outcomes need to be reached. Firstly, the new patient must end the call feeling that this is the dental office for them and that they have made the correct decision to book in there. Secondly, the dental office needs to have conveyed this exact same message to the new patient. The message that this is the best dental office in town, in fact, the only dental office in town, for that person to choose. The message that this dental office is head and shoulders way better than any other dental office around. Thirdly, the dental office needs to have collected all necessary and relevant information that they require during that phone call. It is also important that information not required immediately is left until later and is not collected on this call. Using the Mystery Shop to make a new patient telephone enquiry is an invaluable tool to ensure that your dental office is in fact putting your best foot forward and covering all the bases all the time. Because if you’re not checking, and checking up, then for sure, your office is not performing this process optimally, and new patient opportunities are falling through the cracks in your office. And that’s costly. Very costly. Use the Mystery Shop process to make sure your Dental Office is making that First Impression a great first impression. Answering Your Dental Office Phone Correctly and optimally is just one of the many straight forward and easy to implement modules that make up The Ultimate Patient Experience, a simple to build system in itself that I developed that allowed me to create an extraordinary dental office in an ordinary Sydney suburb. If you’d like to know more, ask me about my free special report. Uniformity and Conformity. There IS a Reason. Is Lack of Consistency Costing You Money? Imagine if you walked into a Police Station and the Police on duty there were not wearing a uniform? I mean, they were in civilian clothes. You see, at the Police Station, we’ve come to expect, that when we walk in, we’ll see people dressed in blue, wearing a badge. And we’ll know they’re police. We’ve come to expect this. And at the fast food outlet, in the McDonald’s scenario, we know what the boy means, but it’s not the same. Ask that question out of the blue any time, anywhere, and the person you say that too, will immediately respond, “McDonald’s”. Say “Chips? !” to that person, and they’d have no idea what you’re talking about. In dentistry, in dental offices I visit around the world, employees are not behaving in a uniform manner. In nearly every case, in nearly every office that I visit, every employee is pretty well allowed to say what they want, to whom they want, and often when they want, without rhyme or reason. Although in some offices, the process of working out what would be best to say, and when, and when to respond, had been, dare I say, “looked at”, there was no uniformity, no consistency, in the answers and the questions, and the icebreakers even, used by the team members. Without a consistent formula, of what to say , and when to say it, and sometimes more importantly, what NOT to say, like I said, without a consistent formula, how on earth can you expect a consistent result? In The Ultimate Patient Experience Programme, that we tailor to your individual office, and which you and your team work with me to create for you, we work out the *best* way to say what, and when, in your office. And then we set that in stone, metaphorically, for the time being, to become the standard, or norm, for your office. Consistency from one day to the next. From one hour to the next. From one team member to the next. So that the telephone is answered in the same way, with the same greeting, every time. But it’s a greeting that your office came up with, and agreed upon. So that your patients are greeted with consistency, each and every time, at every stage of their visit to your Dental Office. So that there are no clangers, no awkward silences. Imagine if your Dental Office was known in your town as the place where all they talk about is the weather? Wouldn’t that be pretty ordinary? In formulating your Dental Office’s protocols and procedures manual, thought needs to be taken to work out, what phrases ands words are best used when, and what phrases and words are best avoided, and never to be used. As an example, the cringe-worthy phrase “Not a problem” should be banished from your office with great haste. Along with the simple fact that it’s a banal mindless, thoughtless response, it is also a double negative, and as such, conveys a subliminal negative impulse. all of these create an aura of appreciation, in a much more positive manner. Dentistry is hard enough to sell, and I use that word purposefully here; it’s difficult enough to sell just because it is dentistry. No one wants to do it. Or at least, no patient wants to do it. The use of carefully crafted phrases and responses that are best used at specific times throughout the patient’s visit, when needed, that are consistent, and purposeful, will have your Dental Office standing out from the crowd of ordinary offices in your area. Because no other dental office in town speaks to their clients and customers with such courtesy, with such interest , with such purpose. And you need to be firm on policy of delivery. There’s absolutely no point in doing this, in creating this new practice blueprint, if it’s not adhered to by all team members. Every team member must follow the procedures and scripts in order to ensure that the best is being delivered at all times to your dental clients. What’s the point indeed, if different team members are allowed to change the words? Allowed to deliver what *they* want? Say what they want, not what’s best. The office just becomes a mish mash. A rabble. The best words to use, and when we use them, are all explained in The Ultimate Patient Experience, a simple easy to implement system that I developed that allowed me to build an extraordinary dental office in an ordinary Sydney suburb. If you’d like to know more, ask me about my free special report. You can’t believe what goes on out there in telephone land behind your backs, Doctors. The other day, my wife Jayne, who works in my Dental office with me, had a need to phone a dental colleague of mine. Now, she called his office on a day when my colleague was not working, but other dentists were there treating patients that day. Jayne wanted, or needed to know, about a particular dental supply that our office had been given by my friend, and where to order some more of that product from. Let’s just pause this right here. Poor old Dr Smith. I bet he has no idea that this person who he had bestowed this honour of answering his incoming phone line is acting with such disrespect toward that duty that she has been chosen to perform. Hello? You have got to be kidding me. I just couldn’t believe this story when Jayne retold it to me. The young lady’s response was just like water off a duck’s back. Jayne said that this young lady just didn’t respond as if she had done anything incorrectly…. When Jayne explained and asked about the product, which I think was a laboratory product that we use sporadically from time to time, but which comes only in industrial quantities, for some ridiculous reason, anyway, when Jayne started enquiring, the assistance and help from this young lady was definitely not provided with any form of enthusiasm. Whatsoever. And sadly, I use the words “assistance” and “help”, in their most loose and relaxed definitions. Jayne wanted to know where Dr Smith purchased this product, and who was the dental supply company that provided it. Sadly, TMI. Too much information here. If Dr Smith chooses to manage the stock control and levels and supply within his dental office rather than delegate that duty, then that’s his business. I’m sure it’s not an industry norm. I’m sure he’s in the minority. But I’m positive that if that’s what he chooses to do, it’s probably *NOT* something that Dr Smith would like blurted around. I’m glad Dr Smith has the time to look after his stock control and his dental supplies. Personally, I don’t. And I delegate. And there are pitfalls and pros and cons with that delegation. And that’s a topic for a whole other blog. On another day. Anyway back to this call. I think Jayne was able to persuade, or asked for the young lady to try and find something for her. Because what happened next will shock you, I’m sure. Just as it shocked Jayne. And me. While the young lady was on the phone to Jayne, searching, a second incoming phone line began to ring at Dr Smith’s office. And it continued to ring. While the young lady ignored it. Hello? What planet did Kelly come from? My point, and brief point, about this phone call from Jayne to Dr Smith’s office is this. Sadly, Dr Smith probably has no idea that his phone is being answered so poorly. And with such a lack of care. And maybe Dr Smith does know that Kelly is not up to par, when it comes to answering his phone. I’ve mentioned before in a previous blog article, about using B Grade players when A Graders are not available. Or you don’t have any A Graders. This looks like one of those situations. To follow up, on another day, Jayne called Dr Smith’s office and spoke with another lady. Who explained that Kelly was not their regular telephone person. And that’s sad. Because the way that Kelly answered the phone call from Jayne, and the way that she ignored the second line ringing, is costing Dr Smith. Costing him *BIG TIME*!! And he’s probably not aware how much it is costing him. Now we all know, that Dr Smith could well have been between a rock and a hard place. He may have had a team member leave, who has been difficult to replace, and Kelly is just filling in. Or he may have someone off sick. But Kelly, by her actions, is not an A Grade player. And that’s costing my friend money. Answering the phone, in the best possible manner, is just one of the many straight forward and easy to implement modules that make up The Ultimate Patient Experience, a simple to build system in itself that I developed that allowed me to create an extraordinary dental office in an ordinary Sydney suburb. If you’d like to know more, ask me about my free special report. Jayne and I had the pleasure yesterday of spending a full day in a workshop with great sales instructor Jack Daly. It’s important to regularly go outside of your industry to look at what other businesses are doing, and how other businesses are dealing with business issues in the day to day running of their businesses. Regularly checking in into one of these non-dental workshops always provides me with business insights into what we could be doing better in the processes and systems we use in our dental offices. One of the key things I learned from Jack yesterday, or let me say, that Jack reminded me of yesterday, was the fact that in business, there is hardly anything that goes on in a sales call that you could not be prepared for. In preparing for those sales calls, Jack reminded me that it’s best to have your sales team role-play and practice, or rather role-practice, their sales questions and answers on each other. This role-practice could take the form of a twenty-minute session three times a week. Or it could be more often. It’s not difficult to find twenty-minute opportunities for two team members to practice and drill their Q&As on each other. What is not appropriate, and what we see so often in the dental office, is that there is no role-practice time, so skills are either learned or never learned on real live office time calls. And this is seriously wrong. Sports teams practice. Pro football teams spend hours and hours and days and days drilling and rerunning moves over and over and over again until they become second nature, so that when game time comes, the moves occur like clockwork, without hesitancy or thought. And if your team are professional, and I mean professional in their approach, they’ll understand the importance of taking the time to learn and practice their skills. So what’s the best way to learn those skills? Jack Daly suggested a way where three team members worked as one unit. One team member would be the prospect. One would be the sales person. The other team member would be the observer. In the role-practice, the prospect’s role is not to be the prospect from hell, but not also to be a push over either. The sales person needs to know the purpose of the call. No call should ever be made without a purpose. In dentistry, the front office person answering incoming phone calls has one purpose. Her purpose is to make an appointment for hat person calling in. When the front office person has this mindset, that the caller has not rung for entertainment because they have a spare five minutes, then things at the front desk work a lot better. The observer’s role is to make three lists. What they like. What was not so good? And suggestions to improve. So during Jack’s seminar we break into groups of three for a fifteen-minute role-practice. At the end of the fifteen minutes here were Jack’s take aways. Firstly, there was more energy in the room during the debrief section of the role-practice than during the “call”. In fifteen minutes, your three team members have each learned *something*, and maybe more than one thing, without having to have been in a seminar…. Given an hour, if the three team members can rotate their roles, the results and take aways can be even more dramatic. The third time role-practice will be way better than the first role-play. The observer role is always the most valuable. The observer in each role-practice is the person who learns the most…. role-practice, repeated like this on a regular basis, several times a week, will have your team members fine tuned and ready and prepared for nearly every sales situation within your dental office. And just lie a sport’s team, the moves are practiced and rehearsed week in and week out. The moves are not just learned and committed to memory. A sports team will drill them down, drill them down and drill them down, every training session. Making sure they become regular, routine, and natural. And that’s what makes a professional outfit. That’s what makes a successful outfit…. Are you and your team doing what it takes? 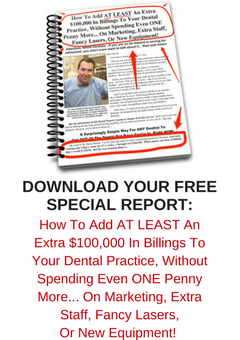 Does Your Dental Office Have An Ultimate Referral Procedure? One of the procedures we are really proud of at Active Dental is how we refer our patients off for specialist dental care. So much so, that we incorporated this courtesy into the Ultimate Patient Experience Programme as the Ultimate Referral Procedure. Firstly, at Active Dental, we’ve always prided ourselves on being able to have visiting specialists come to our rooms, in the first instance. And having visiting specialists available in your office is the Ultimate in Patient Care, because you are offering a One-Location, one place venue that your patients are already familiar with and comfortable visiting, for all their dental needs. However, as times and personnel change at your office, it may not always be possible for you to offer in-house care, and in these instances it is necessary to refer our valued clients and patients out and away. So does your office have a procedure and protocol for referring patients out? What I see mostly at other dental offices is the patient leaves the general dental office with a referral in hand, and no real idea of what they are to do next, and with what form of urgency. And often, this is where a major breakdown in communication occurs. Often we’ll see a dental office where patients have been referred out to a specialist, only to disappear into the ether, never to be seen again. Seems the patient in these instances does not have any perception of urgency of treatment. They have been given little if any information or shared knowledge about their treatment required, and its importance, and have not been informed of the consequences of a delayed treatment, nor of the consequences of them taking no action at all. When patients fail to attend to their referral in a prompt manner, they are doing themselves a disservice as well as doing our office a disservice as well. And this is why we developed and instituted The Ultimate Referral Process. You see, there are no winners when patients fail to act on a referral promptly. Decay, infection, and periodontal disease, do not diminish with time. In fact, with time, they only get worse. So prompt action needs to be taken, to ensure minimal damage and to ensure best outcomes for the patient and for their condition. So here’s what we developed as The Ultimate Referral Process…. Firstly, as part of our Front Office Post Treatment protocol, the patient is made fully aware of and has accepted the reasons and the urgency for them to see a specialist for their condition. From this point, the Front Office Person at your dental office then moves into action, with exemplary World Class Customer Service. The Front Office Person then weaves her magic…. Rather than send the patient off into the ether, our Front Office Person there and then, in front of the patient, calls the specialist office and organises the appointment for the patient right then and there in front of them. This process is always done including the patient in the telephone conversation with the specialist office. The patient of the practice is very appreciative of the referral being organised right there right now. The process is underway…. The phone call, that our patient hears and sees right there between our office and the specialist’s rooms is always a very friendly and amicable one, like two friends chatting. This really helps to make our patient feel at ease. The call is completed courteously, and arrangements are made to forward necessary images from our office for the patient. Once off the phone, the Front Office Person then makes sure the patient has a record of the appointment time, and that the patient knows exactly where the specialist’s rooms are located. Our patient is asked their means of transport, and we make sure they have very clear instructions and directions for finding the specialist’s rooms. Our patient is also informed about the urgency of treatment, and any follow up treatments that are required following seeing the specialist. Our endodontists always emphasise the need for full coverage restorations to be placed as soon as possible after completion of root therapy. Our valued clients are so appreciative of the virtual “hand holding” from our Front Desk Person in organizing these specialist appointments. Because no other dental office around does this! And medical practitioners don’t do this either? Can you imagine the barbecue or party conversation when your patient tells their friends that not only did they get referred to a dental specialist, but that the Dental Office rang and arranged their appointment there and then, emailed all necessary records and radiographs, and placed them on a priority stand by list in case an earlier appointment became available? Because no other dental office around does this…..
What do they say in the classics?